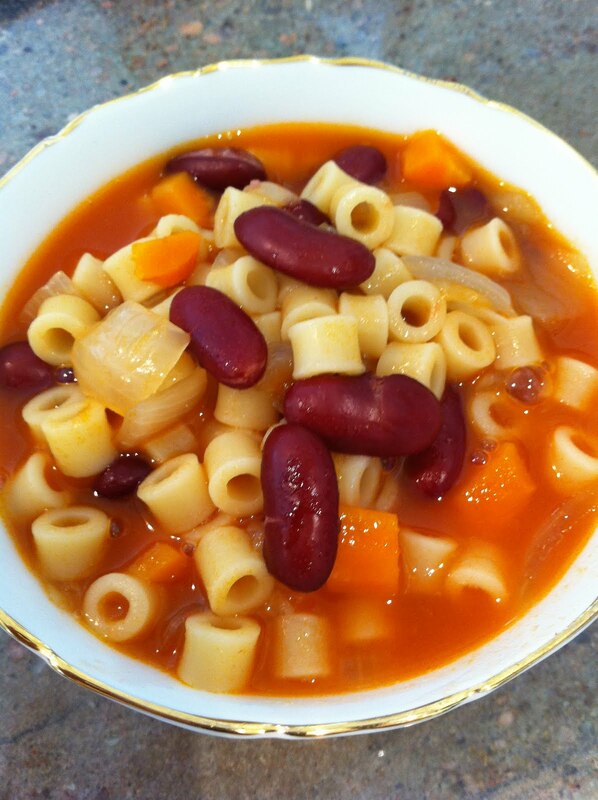 Quick and easy version of the classic soup with lots of pasta, the “baby noodles” and lots of fagioli, the hearty red kidney beans. Ah, goodness! I like the make the pasta separately just in case I have leftovers so I can freeze the rest. Then I make new pasta when I defrost and reheat. Makes 4 to 6 bowls. Heat up olive oil in a deep pot and add the onions. Season with a salt and pepper. When they are translucent, add the carrots and celery. When they are just cooked, add the tomato paste and sauté for another minute to release the flavor. Next, add the kidney beans and water or stock. Make the pasta separately. The soup is done looks beautiful and smells delicious. Mix in the pasta and serve. Enjoy!